This is a sketch from a couple of weeks ago. It is pen and markers on paper, in my Moleskine journal. It was really not meant to be any sort of political commentary. I was listening to some old Beatles’ music, and thinking about the line, “all we need is love.” It is a wonderful thought that love, and art, have the power to change. 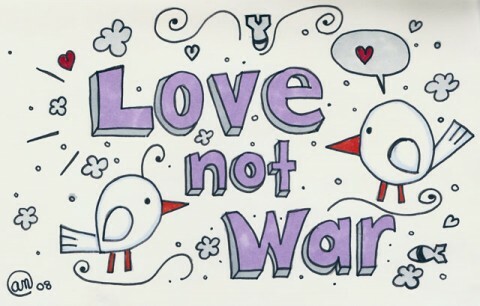 I just really wanted to focus on the positive energy of love, rather than the negative energy of violence and war. Anyway, spread more love today, and tell those people close to you in your life how much they mean to you, even if you think they may already know.